Studying isn’t what you think it should be. So, what does studying actually look like? Today we explain the do’s and don’ts of studying as well as ways in which to transform the “don’ts” into positive, helpful strategies. These thoughts and tips are applicable to students of all ages. Let’s first address the purpose of studying. The purpose of studying is to be able to recall information on demand, in a classroom setting. The reason why we word it this way is to really give students the context of why studying is important. As adults, we do not sit down to study. This is because we are usually seeking information for pleasure. Students on the the other hand, sit down to study because they have a goal. This is something to be mindful of when thinking about studying. Students are studying with the intention of earning a grade. It should also be noted that it is a non-preferred task for students. Students might have to seek information on a topic that is not particularly interesting to them, whereas adults tend to seek information when they are interested. 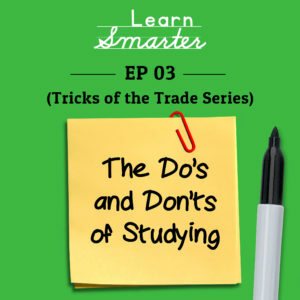 Throughout this episode we are going to refer to the do’s and don’ts of studying as active and passive studying, respectively. During active studying, the student is seeking out information and doing something with it. During passive studying the student is really just having the information come to them. Passive studying is more “traditional” side and is actually what most students tend to do. It is definitely what you “think studying should look like”. We are going to address six inherently passive studying tips and explain how they can be turned into active studying exercises. What are the challenges with highlighting? For starters, most students don’t know how to highlight correctly. Often times students will highlight entire paragraphs or even pages. This does nothing to help them. Essentially, the only thing they really did is color the page. So, how can highlighting be used as an active studying tactic? The main goal when highlighting should be to shorten, chunk, and summarize the information the student is trying to learn. This means identifying the key points and not just identifying vocabulary words (that are usually in bold print anyways). If a student does highlight an entire page, they should go back through and identify the four W’s: who, what, where, and when. This is fact seeking in its most literal form. Once this is done, the student should address why they think this information is important. This is what creates an active studying technique. As the student answers these questions they are taking information in and processing it. This form of mental engagement will allow the student to remember the information more easily. Students might think that if they are re-reading material they are freshening their mind on what they already read. The problem with this technique is that it tricks their brain into thinking they know the information because they have seen it before and they then tend to skip over information. This is when the four W’s exercise becomes meaningful once more. Ultimately, students need to be doing something with the information they read in order for them to remember it. In other words, there needs to be an action step. Think about a time when you have experienced a major event in your life and you’ve had to write hundreds of thank you notes. The one thing you probably don’t remember is the little details of who got you what. This is because this is an entirely passive exercise. All you are doing is rewriting the same sentences on every note with minor changes such as the name of the person and what they got you. Rewriting is not active. However, you can make it active by categorizing, summarizing, or rewriting the notes from memory and then going back to see if you were correct. This will turn it into an active technique. How many of you have a kid who easily gets lost in a Youtube hole? There are many, MANY “how to” videos out there about any concept. It is easy for kids to go to Youtube to “study” for a test. We agree this is dangerous but if your child likes this strategy, then they must be able to describe (out loud or on paper) what was taught in the video. This requires monitoring as we are ALL in danger in spending hours on Youtube. . This is our biggest “Don’t” of studying! What tends to happen in this situation is that students with pure intentions just go over the information they already know. This is information they have learned years previously or happen to remember. Therefore, they feel like they are prepared. This, of course, does not work and this student is let down: they THOUGHT they were well-prepared! But they only reviewed what they already knew–when they should have spent their time studying what they did not know. Figuring out what you know and what you don’t is critical and this is where an education therapist can come in to help. Why is this so bad? Well, for obvious reasons. Students tend to get too comfortable and fall asleep. This leaves zero room for active studying. Choosing a wise location to study is essential. Now, let’s dive further into the concept of active studying. What active studying is really about is engaging all of your senses in the studying experience. If the student engages all five senses, it increases the likelihood of their retention and their ability to recall information on demand. In the context of studying, the five senses refers to a student’s location, what they smell, what they are eating, what they are hearing (maybe they listen to music while studying), and the time of day. All of these aspects truly matter and can serve as memory triggers. This is one of the main reasons students are encouraged to switch up the time of day, their location, what they are doing, and what the background noise is while they are studying. You never know from what experience you will be able to recall information. How many times have you heard a certain song and have been able to remember a specific point in time? This is why we encourage students to make similar connections when studying. When it comes to summarizing, there are a few helpful strategies that can be taught to students. One is having your kid read out loud and summarize what they heard. They can look over a section and then verbally tell you or a peer the essential information. Once a student has been able to verbalize the essential information, have them shorten what they have explained in even fewer sentences. This will put the student in a position where they will have to sit with, process and engage with the subject. Taking studying even further, have the student create a quiz/test, specifically in the same format their teacher would set it up. This gives them the opportunity to predict what the teacher may find important. It’s also really fun if you, the parent, is willing to take the quiz or test your child created. As your child corrects you and is able to explain why you got an answer wrong, they are actively engaging in the topic and therefore, studying. How does my child know if they are studying actively? It may be hard for students to know whether or not they are using active or passive studying techniques. However, there is a trick of the trade to help create a framework for this situation. You are actively studying if you have the possibility of finding out that what you previously thought was incorrect. This is key. You must be able to prove what you think wrong in order for it to be considered an active studying exercise. Studying is all about taking the information and doing something with it. One of the more common things we hear from parents is that their student studied “for hours” but still didn’t do well on a quiz, test or exam. Listen to this episode to hear how Rachel & Steph think about studying: they break down what studying should be, how to maximize study time, how there isn’t necessarily a correlation between time spent studying and outcomes and the differences between active (great) and passive (not ideal) studying. Next week, be sure to listen to the companion episode, “How to Create a Study Plan”. Don’t forget to go to our website, www.learmsmarterpodcast.com, to joing our community and to receive the freebie Calendar Checklist from episode 2 “How to Calendar”.